The Centre has lauded the involvement of government officials in successfully implementing sanitation programmes across states. A recent communiqué issued by the Ministry of Drinking Water and Sanitation (MDWS) states that the implementation of such projects has been a success in those states where district magistrates (DMs) and district commissioners have personally monitored the schemes. Swachh Bharat Mission (SBM) is Prime Minister Narendra Modi’s pet project, whereby the aim is to achieve a clean India by 2019. In this regard, MDWS is conducting a series of training programmes since February 2015 for district officials where the latter are being briefed on the success stories of districts and blocks where open defecation has come to an end. One such district is Churu in Rajasthan. 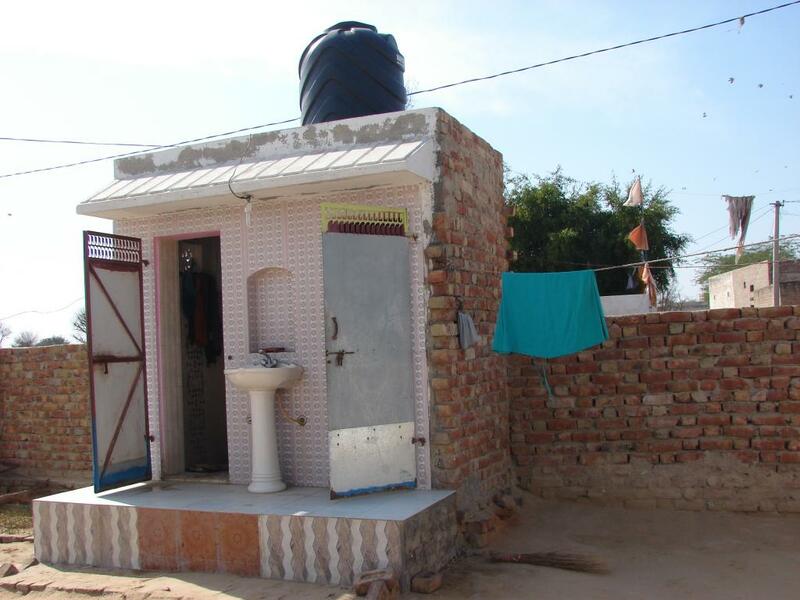 Taranagar block in Churu was declared open defecation-free (ODF) last year and other blocks in the district are moving towards the same by emulating Churu’s model. DM Rohit Gupta, who initiated the sanitation campaign in Churu, said the total sanitation model helped the block attain the ODF status. On one hand, while desert state Rajasthan led a battle against open defecation, fertile Bengal is also not far behind. Nadia district attained the ODF status in April this year. In June, the district received the United Nations Public Services Award 2015 for this achievement. Former Nadia DM P B Salim played a vital role in taking Nadia to this great height. Nadia’s campaign, known as “Sabar Souchagar” (toilets for all) was an entirely community-driven idea. The Centre has set 2019 as the target year for SBM and West Bengal plans to achieve the Nirmal Bangla Mission by 2017 by building toilets in every district. However, the laudable thing is that Nadia has already attained an ODF tag. Located in the southern part of Bengal, Nadia is considered a backward district. According to the 2011 Census, the population of this district stood at 5.2 million. 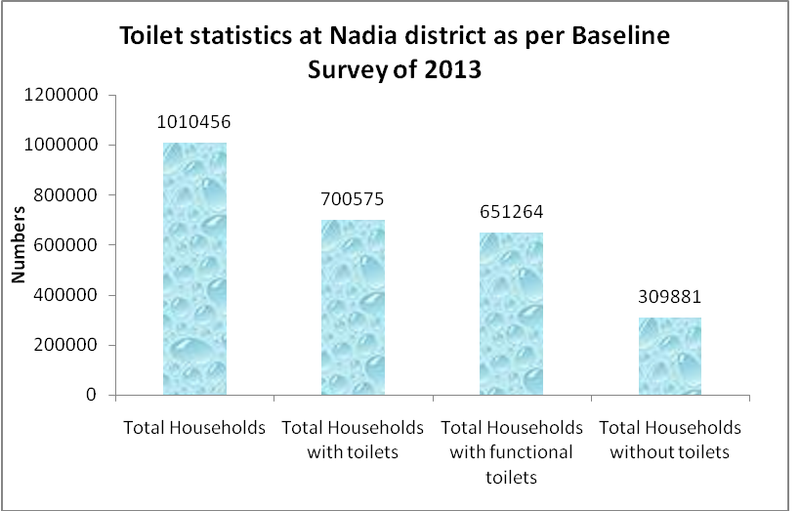 The graph below shows the toilet statistics in Nadia. The “Sobar Souchagar” model evolved through converging the Nirmal Bharat Abhiyan and the Mahatma Gandhi National Rural Employment Guarantee Act. At the implementation level, the sanitation model was also converged with the National Rural Livelihoods Mission. The “Sobar Souchagar” model was devised as a pilot project in 17 gram panchayats in Nadia. Once it was successful, the project was rolled out in all the 187 gram panchayats of Nadia on October 2, 2013. According to the Bengal government, the achievement rate of ODF was only 1-2 per cent during the pre-campaign phase and increased to almost 300 per cent in 2013-14. 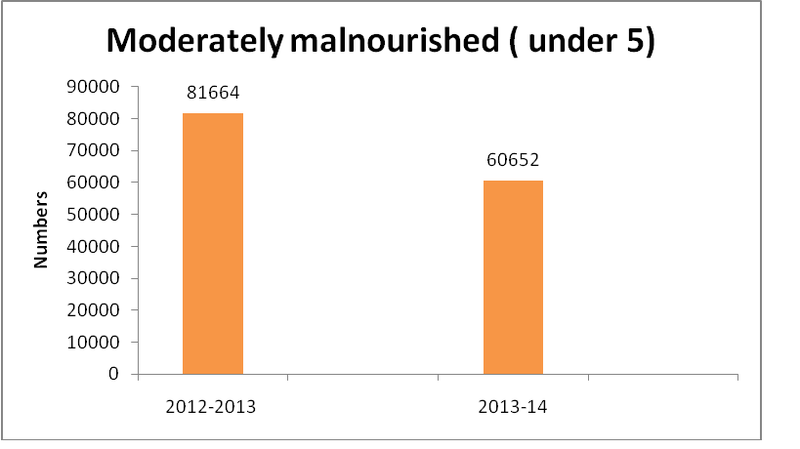 The rate was again maintained in 2014-15. 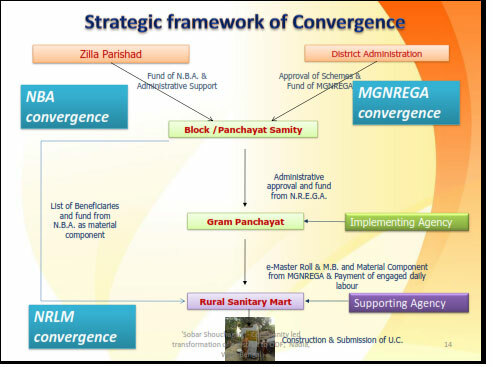 The photo shows the convergence strategy behind the Nadia sanitation model. Mobilisation of key stakeholders, women, children and effective behavioural change communication for ending open defecation. Faith-based organisations were also involved strategically in the mission. A series of meetings were also held in schools. Puppet shows, cycle rallies and well-developed information and education materials were designed in the villages. Doctors played a big role in awareness campaigns. Women and children were used as main change agents. 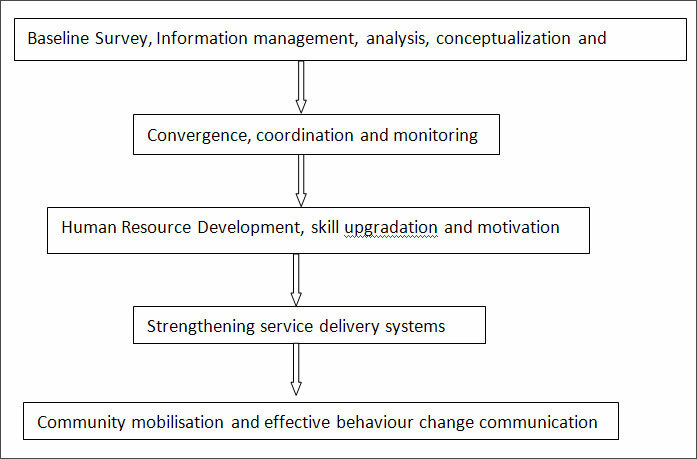 To make the model work, a synergy was created among different governmental departments. For instance, the Panchayati Raj and Rural Development Department looks after rural sanitation, MGNREGA and panchayat empowerment. Close monitoring from district to the village level (the monitoring days were fixed) and reviews were carried out. The design of the toilets (dual pits) was done according to the geological and soil condition of the area. Notable outcomes of the sanitation campaign in Nadia were that the collective behaviour changed, women became empowered and a positive impact was seen in improved healthcare system in all blocks. 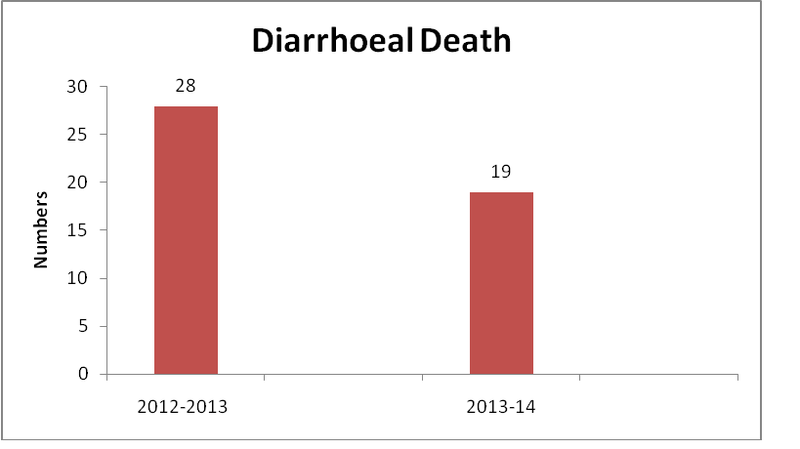 The graphs below show that diarrhoeal diseases and subsequent deaths came down sharply after Nadia achieved open-defecation status. 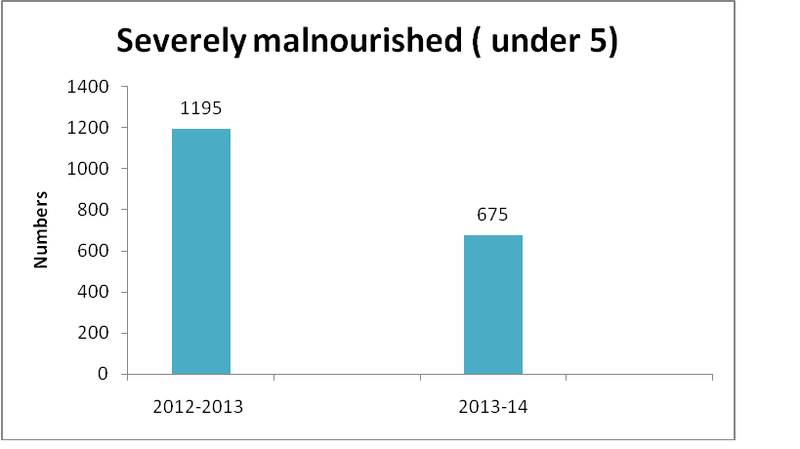 The malnourishment rate also came down. Nadia spent 97 per cent of the state share in 2013-14 and 100 per cent of the share in 2014-15. The amount spent on information and education communication materials in 2014-15 is almost five times the amount in 2013-14. 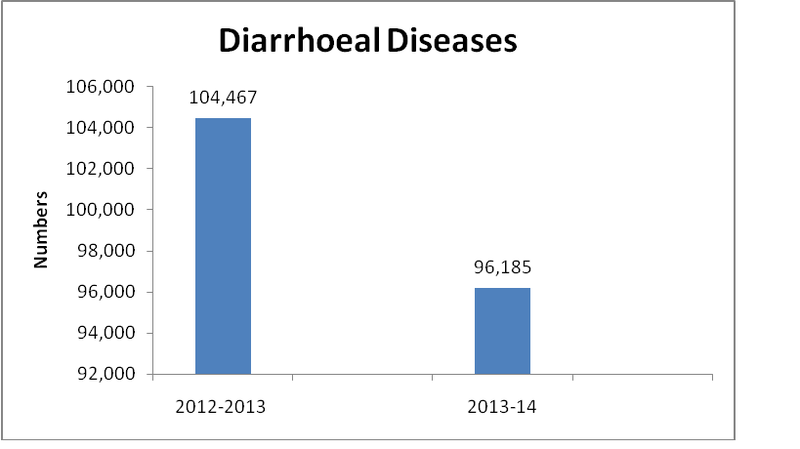 This shows how well the district had used communication to mobilise the open-defecation free movement. The main challenge is now to keep up the good work and manage the solid liquid waste, sources at the collector’s office told Down To Earth. The work on managing solid liquid work has already started in five blocks according to the district website.